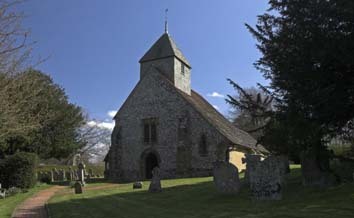 The nave is early C12 with a C13 chancel (largely rebuilt in the C19), C14 south aisle and a south chapel of c1500. Westmeston, like Ditchling and Streat, is a long, sparsely populated parish running north from the Downs, with a few houses and the church by a crossroads. 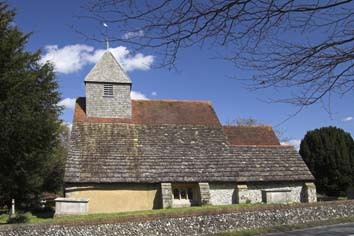 The partially rendered flint nave of the church was originally aisleless and a simple, round-headed north doorway shows it is early C12. The probable early C12 dating of the lost wall-paintings (see below) would fit this. 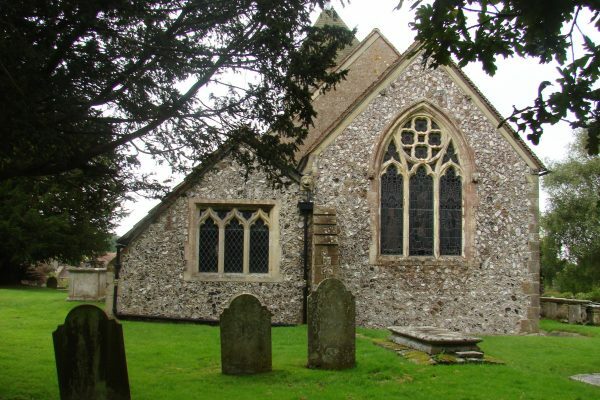 Until 1862 the chancel arch was of the same date (see 2); shallow pointed recesses each side (2 p4) for altars may have dated from the C13 reconstruction of the chancel, which is markedly inclined to the south and has two north lancets; little of them now looks old, though part of the south wall may be, and it incorporates an early C16 arch and a C13 piscina (see below). The late C14 south aisle has a two-bay arcade with an octagonal pier, double-chamfered arches and square responds with moulded corbels for the inner orders. 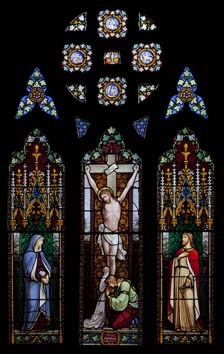 The single-light ogee-headed west window is renewed and the south one, consisting of three uncusped lights, appears all C19. The depressed rere-arch of a south doorway survives, but the C14 north porch shows the main entrance was this side. It is mostly original, though the base is probably C17. The Sharpe Collection drawing (1802) shows only a C14 trefoiled lancet east of the porch, so the one nearer the porch is entirely C19. Probably as part of the C14 work, the west wall was thickened and provided with angle-buttresses to support the belfry with a pyramid cap. Now shingled, the Sharpe drawing shows this with boarded sides. In conjunction with this the nave roof was replaced and some ties survive. Of the same date are a moulded west doorway (weathered) and a two-light square-headed window. About 1500 a south chapel was added to the chancel. As built, its lean-to roof continued that of the aisle. Quartermain ((E) p302) and the Sharpe drawing show an east window only, which is still the case in the much rebuilt chapel today. In the Sharpe drawing it is square-headed with three apparently round-headed lights, but the later Quartermain drawing shows it pointed but without tracery, so some work had been done in the interim. 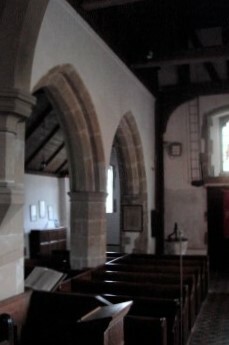 The arch into the chancel and the smaller one from the aisle are both double-chamfered, the inner orders resting on polygonal corbels with mouldings that are shallower than the C14 ones. 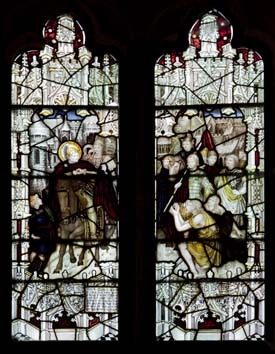 The east window of the chancel is obscured in the Sharpe drawing, but Hussey calls it ‘debased Perp’ (p303); this term usually means work after 1500 and there may have been further alterations to the chancel then. The state of the east window of the chapel, whether in Quartermain’s drawing or the Sharpe one, and the presumed C17 base of the north porch indicate work in the post-Reformation period, but there are no records. The C19 restorations are not fully researched. In 1848 Charles Campion became rector and soon afterwards restored the chancel (4 p7), as was his obligation. The east wall was replaced, including a new window with C14 type tracery. 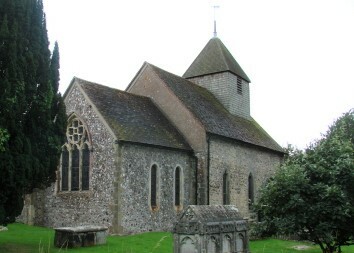 The rest of the church was restored by W Slater in 1862 (B 20 p699). As well as a new chancel arch in C14 style, this included extensive refacing of the exterior, new windows, and the transformation of the south chapel with a new square-headed east window with pierced spandrels, a later C14 device intended to match the rest of the church. Though the south wall remains very low, there is an east gable, entailing a new roof, boarded like all the others. Basil Clarke mentions a third restoration by R H Carpenter in 1867, but gives no source. He is usually accurate, but the closeness of date and the fact that Slater and Carpenter were closely associated (at the time Carpenter was still Slater’s pupil) suggest confusion with the well attested 1862 work or, at best, a completion of it. A payment of £95 18s 6d in 1892 to S H Norman (ESRO Par 506/9/1) was probably for repairs in his capacity of contractor. Font: C12 with a plain tapered round bowl on a round stem. A K Walker (p122) noted repairs to the worn bowl in plaster, which are no longer apparent, suggesting repairs since she wrote in c1908. 1. (East window) J B Capronnier, 1873 (signed). 2. (North chancel, first lancet) Clayton and Bell, 1874, in memory of Campion’s wife. 3. (North chancel, second lancet) Clayton and Bell, 1889, in memory of Campion. 4. (West window) C E Kempe, 1890. The subdued colouring contrasts with Capronnier’s bright, even lurid, hues. 5. (North nave, second window) R Hallward, c1915 (signed). Memorial: (Churchyard) Peter Newnham (d1916) Headstone by E Gill, 1922 (E R Gill p60). Paintings: The very faint paintings Campion described (see 2) included a group interpreted as Christ handing the keys to St Peter (cf Clayton, West Sussex which is nearby) and in place of the more usual Christ in Judgement, an Agnus Dei above the chancel arch, as at Hardham, West Sussex. On the north nave wall were representations of the Betrayal of Christ and of St Peter cutting off the ear of Malchus (See J L André 1900 p300) , both of which would have belonged to a Passion cycle, often found in this position, The paintings at Hardham and Clayton were unknown in 1862 and Campion’s drawing attached to his article is decidedly Victorian. The failure to preserve the paintings is a great loss, for they almost certainly belonged to the so-called ‘Lewes Group‘ and were probably early C12. An unusual feature was the presence of inscriptions in Latin hexameters. 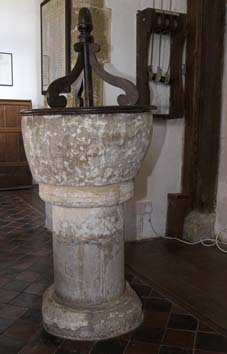 Piscina: (South chancel) C13 with a trefoiled head. Pulpit: Late C17 with panelled sides, decorated with beading.